A short paper in Optics Express looks interesting. In A high speed wavefront determination method based on spatial frequency modulations for focusing light through random scattering media, Meng Cui presents a method for rapidly determining the optimal wavefront to ‘cancel out’ the scattering when 785nm light passes through turbid media. In his example, a glass diffuser was used, but the clear goal for this work is to replace the glass with a brain. To understand why this is so important for in vivo two-photon imaging, let’s review how 2-p imaging works. Light from a laser is focused to a point and swept across the field in a raster. The resulting fluorescence is of a different wavelength and can thus be filtered out from the excitation light. For each voxel, all the fluorescence that re-enters the objective is collected, regardless of its source. The total amount of fluorescence collected for that timepoint in the sweep is assigned as the brightness of that voxel. Since the user knows where the laser was being aimed, scattering of fluorescence emission may reduce the brightness but will not blur the image. However, scattering of the excitation light can dramatically reduce the excitation at the target voxel while increasing the off-target excitation of its neighbors. This causes a rapid increase in background fluorescence and blur at increasing brain depth. Scattering in the brain warps two-photon excitation light, but adaptive optics can correct this. For applications on biological tissues, acquisition time on the order of one millisecond (ms) per degree of freedom is desired. Deformable mirrors can provide a high modulation speed. However the degrees of freedom are rather limited. A phase-only SLM can provide about one million degrees of freedom at a much lower modulation speed. In this work, I present a novel method, capable of providing as many degrees of freedom as a SLM with a data acquisition time of one ms per degree of freedom. The method was employed to focus light through a random scattering medium with a 400 ms total data acquisition time, ~three orders of magnitude faster than the previous report . Compared to existing techniques, the reported method can provide both a high operation speed and a large number of degrees of freedom. In the current design, the operation speed is limited by the scanning mirror speed and the maximum number of degrees of freedom is limited by the SLM pixel number. In this demonstration, 400 spatial modes in k space were visited and the determined phase profile was displayed on the SLM. Depending on the scattering property of the media, more (up to 1920 x 1080) or less number of degrees of freedom can be used to optimize the focus quality and the operation speed. Using a stepwise position scanning, the method achieves an operation speed of one ms (400 μs transition time + 600 μs recording time) per spatial mode, ~three orders of magnitude faster than the previous report. Using a continuous position scanning and a faster position scanner such as resonant scanning mirrors, polygon mirror scanners, or acousto-optic deflectors, the operation speed can be potentially increased by at least one order of magnitude. It is anticipated that the reported technique will find a broad range of applications in biomedical deep tissue imaging. Three excellent pieces of neuroscience software have been recently updated or freshly released. I have used two of them, Ephus and ScanImage, on a daily basis as primary data collection tools. The third, Neuroptikon, is quite useful for post-hoc illustration of neural circuits. Ephus is a modular Matlab-based electrophysiology program that can control and record many channels of tools and data simultaneously. Under control of a sophisticated internal looper or external trigger, you can initiate an ephys recording, trigger camera frames, adjust galvo positions, open/close shutters, trigger optical stimulation, punishments, rewards, etc. It is a workhorse program for non-imaging related in vitro and in vivo electrophysiology experiments. Ephus is named for the fabled baseball pitch, and pronounced as “EFF-ess”. As with the pitch, it may trick you at first, but eventually you’re sure to hit a home run. Of course, the name also evokes electrophysiology, which is the fundamental orientation of the project, be it optical or electrical. Ephus 2.1.0 is a major release, and the only official version at this time. The software is fully described in a publication in Frontiers in Neuroscience. New features include unlimited recording time, with disk streaming, for applications such as EEGs and long traces during in-vivo behavior. A number of additional scripts for in-the-loop control have been added. New configuration/start-up files have been created, with a template to help get up and running quickly. This release also includes a number of bug fixes. ScanImage is another Matlab-related software program that is used for optical imaging and stimulation of neurons in vitro and in vivo. It finds much use a control platform for 2-photon imaging, glutamate uncaging and laser-scanning photostimulation. An early incarnation is described in this paper by Pologruto, et al. It provides a lot of power right out of the box (bidirectional scanning @ 0.5ms/line, etc) and is easily extensible via custom user function plugins. Neuroptikon is a sophisticated network visualization tool. It can build Van Essen-like diagrams of any circuit you like, but it is so much more. The direction of communication is animated, and subsets of regions and connections can be brought into focus, which greatly eases the clarity of the network. The diagrams can be built in three-dimensions, to preserve relative topography, or functional grouping. There is simple GUI-based control, while more complex tasks can use a scripting interface. This is great software for anyone who needs to imagine information flow in a complex network. All three tools are released for free use under the HHMI/Janelia Farm open source license. An interesting paper on two-photon activation of channelrhodopsin-2 is out in Biophysical Journal. 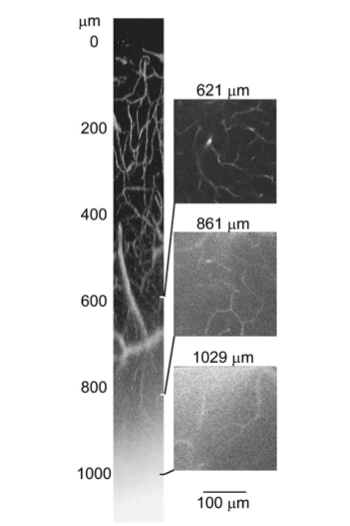 In In-depth activation of ChR2 sensitized excitable cells with high spatial resolution using two-photon excitation with near-IR laser microbeam, Mohanty et. al show cellular activation with a fast-scanning two-photon laser. Action potential generation from Channelrhodopsin-2 with a two-photon beam has been difficult to achieve, presumably due to the small activation volume of the 2p spot. They show similar calcium transients in response to 2p stimulation as with one-photon stimulation. As depth increases, the one-photon response attenuates faster than the two-photon. Unfortunately, the supplemental info with electrophysiology traces are not yet online. Presumably, they are generating action potentials, but I’d like to see the raw data. Interestingly, they also show calcium increases when the laser stays in once place. This would imply that local depolarization causes local voltage-gated calcium channels to open, or that calcium is getting through the ChR2. I was under the impression that ChR2 has a low conductance for calcium, though this study by Caldwell et. al, in press for JBC, uses ChR2 specifically for its calcium permeability. I’m not sure what to make of the first paper. 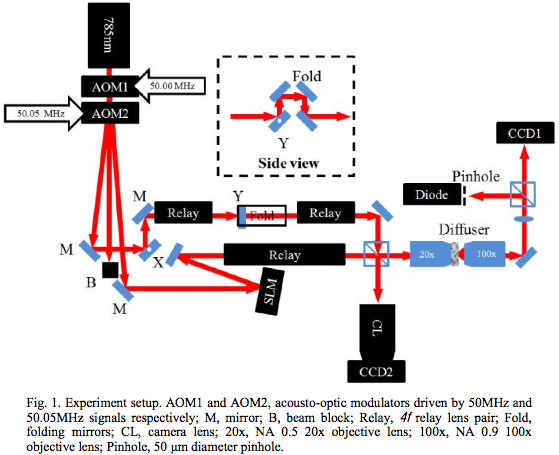 Are they really able to fire action potentials with two-photon stimulation, at depth? Or are the calcium traces they are seeing simply the result of localized calcium flux. I’ll followup once the Supplemental Data becomes available. Still worth a look if this is the sort of thing you are interested in.